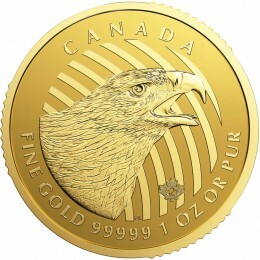 First off, I want to inform you that yesterday afternoon, I made what I view to be a “no-brainer” trade, in swapping some of my gold Maple Leaf coins – held at Miles Franklin’s Brink’s storage vault in Montreal – for newly minted “Peregrine Falcon” silver Maple Leafs; i.e., the first of the Royal Canadian Mint’s “birds of prey” limited edition series. 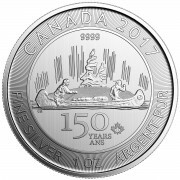 As I wrote in this February 7th description of the RCM’s 2011-13 “wildlife series,” all six such coins – of which, just one million of each were minted – trade at significant premiums to generic silver Maple Leafs. Supplies of silver Peregrine Falcons are still available, although I’m not sure how many of the one million coins issued remain. Given that the Falcons are still selling at prices not far from those of generic Maple Leafs – not to mention, the historically high gold to silver ratio – the decision to make this swap was one of the easiest I’ve made. For the record, I did the exact same thing a year ago, when the last of the wildlife series – the silver Wood Bison – was issued; and as of today, it trades at a significant premium to generic silver Maple Leafs. Hopefully, you’ll call Miles Franklin to ask about the Falcons; as in our view, such an opportunity should not be ignored! Time and again, the Cartel moves into hyper-drive during this narrow window of time to discourage options holders from taking PHYSICAL delivery; and amidst an environment where gold registered inventories are already near record low levels, how can anyone be surprised? In fact, of the piddling 649,000 ounces of registered gold inventories as of last night, Harvey Organ believes 98,000 ounces are still awaiting delivery from the December and January contracts, whilst 394,000 ounces have been served for delivery of the February contract; let alone whatever is demanded from yesterday’s expiring March contract. In other words, there are essentially no physical supplies available; and thus, amidst the most PM-bullish news environment imaginable, the Cartel, of course, is doing its thing; albeit, not accomplishing a lot, given that as I write just after the “key attack time” of 10:00 AM EST, gold has now bounced twice off the blatantly obvious “line in the sand” at $1,330/oz. the Cartel has desperately, but futilely, attempted to enforce for the past week. In fact, they were so terrified that things would get out of hand after yesterday’s strong COMEX option expiration closes, they were forced into a rare ultra-late day PM “walk down,” a full hour after the typical 2:00 PM EST crybaby attack time; followed, of course, by the 176th “2:15 AM” attack of the past 199 days – “cartel heralds” and all. Not to mention, as caught below, utterly vertical drops of $0.10/oz. and $0.40/oz., respectively, at exactly 9:40 AM EST (just after the NYSE open) and 10:40 AM EST (just after the London PM fix), after having “topped” at exactly 8:40 AM EST (just after the COMEX open). You know the exact same price action we have observed for the past decade. Moreover, the news “supporting” such attacks was led, of course, by the “alternative currency” of Bitcoin witnessing the all-out collapse of its leading exchange. You know, “gold 2.0,” according to the Winklevoss twins. Next up, a new all-time low for the Russian Ruble, as its critical geopolitical neighbor, the Ukraine, itself sees its currency collapse – and banks run – as the potential for a bloody civil war dramatically increases. And then, at 7:00 AM EST – i.e., the open of the ultra-thin New York “pre-market” trading platform – the Mortgage Banking Association reported that U.S. mortgage originations plunged to a new 19-year low. But don’t worry, Dow futures didn’t budge from the +40 level all morning (where, by the way, they still sit as I write at 11:00 AM EST); nor did European stocks from their roughly 0.4% losses, or oil prices from their strong gains. In other words, only gold and silver prices even moved; in doing so, plunging amidst wildly PM bullish news. …TPTB attempted to convince the masses that new home sales exploded higher – even as the median price fell back to levels from a year ago! Better yet, as we spend day after day being told that across-the-board, horrific economic data was due to “bad weather,” the new home sales report depicts the strongest activity taking place in the two regions hardest hit by such weather – i.e., the Northeast and South! Moreover, “technicians” will of course say PMs are down because, based on the RSI, or Relative Strength Index, PMs are “overbought” – and thus, need to “correct.” We view such short-term factors as irrelevant in a manipulated market; but if forced to utilize technical analysis, would focus more on the clear “double-bottoms” both metals appear to have made, and the fact that both are still above their respective 200 day moving averages. Not to mention, that both still trade below their respective costs of production, and – oh yeah, the wildly bullish ultra-­ long-term charts we wrote of on January 2nd and February 17th. Now that that’s off my chest, let’s discuss the “definition of value” name-saking today’s article; which financially, always goes back to the most important slide in our Power Point Presentations. That is, why only gold and silver have survived the millennia as money – and not fiat currency, Bitcoins, or other assets with no intrinsic value. This theory has been successfully tested thousands of times throughout history – including the 599 fiat currencies that have previously failed, and the Mt. Gox Bitcoin exchange. And thus, it shouldn’t surprise anyone that yesterday’s news that a California couple found a stash of U.S. government minted gold coins from the mid-to late 1800s buried under a tree – with a face value of just $27,000, but a market value above $10 million! 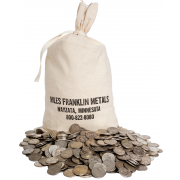 Yes, a handful of “barbarous relics” with “no intrinsic value,” buried in tin cans for 150 years managed to increase in value by nearly 400 times; whilst the Confederate dollar collapsed, the Northern “greenback” nearly did, and the modern dollar lost roughly 99% of its value. The aptly named “Saddle Ridge Treasure” is a perfect example of why we hold PHYSICAL gold (and silver) as “stores of value”; and thus, when considering how you should protect your assets, I hope you’ll view this as a lesson in the “how to” department. Better yet, if this story doesn’t prove to you gold’s worth, consider this. 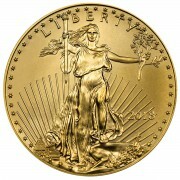 What do you think a one ounce gold coin will be worth 150 years from now? As well as a dollar, Euro, or Yen? And of course – good luck on this one – a Bitcoin? +1 from me Mr. Hoffman. Amongst some of the few gun writers in the business.